WOODS HOLE, Massachusetts, August 17, 2012 (ENS) – High levels of background noise, mainly from ships, have reduced the ability of critically endangered North Atlantic right whales in a marine sanctuary to communicate with each other by about two-thirds. The scientific team was led by researchers with the National Oceanic and Atmospheric Administration, NOAA. From 2007 until 2010, scientists from Stellwagen Bank National Marine Sanctuary, Cornell Lab of Ornithology, NOAA Fisheries Northeast Fisheries Science Center, and Marine Acoustics Inc. used an array of acoustic recorders to monitor noise levels, measure levels of sound associated with vessels, and to record distinctive sounds made by multiple species of endangered baleen whales. These included “up-calls” made by right whales to maintain contact with each other. NOAA Fisheries Northeast Fisheries Science Center documented more than 22,000 right whale contact calls as part of the study during April 2008. Software developed by Cornell and Marine Acoustics Inc. of Arlington, Virgina aided in modeling ship noise propagation throughout the study area. Vessel-tracking data from the U.S. Coast Guard’s Automatic Identification System was used to calculate noise from vessels inside and outside the sanctuary. By comparing noise levels from commercial ships today with historically lower noise conditions nearly a half-century ago, the authors estimate that right whales have lost, on average, 63 to 67 percent of their communication space in the sanctuary and surrounding waters. “A good analogy would be a visually impaired person, who relies on hearing to move safely within their community, which is located near a noisy airport,” said Leila Hatch, Ph.D., NOAA’s Stellwagen Bank National Marine Sanctuary marine ecologist and lead author of the paper. North Atlantic right whales, which live along North America’s east coast from Nova Scotia to Florida, are one of the world’s rarest large animals and are on the brink of extinction. 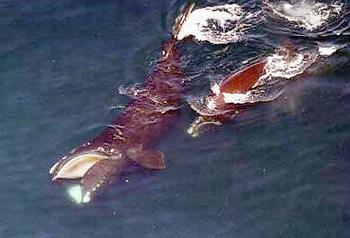 Recent estimates put the population of North Atlantic right whales at approximately 350 to 550 animals. “We had already shown that the noise from an individual ship could make it nearly impossible for a right whale to be heard by other whales,” said Christopher Clark, Ph.D., director of Cornell’s bioacoustics research program and a co-author of the work. The authors suggest that the impacts of chronic and wide-ranging noise should be incorporated into comprehensive plans that seek to manage the cumulative effects of offshore human activities on marine species and their habitats.